Take a peek at Florida history. Discover an overview of Florida's rich history, heritage, historic events, and culture. In fact, as late as 1600, Spain's power over what is now the southeastern United States was unquestioned. When English settlers came to America, they established their first colonies well to the North - at Jamestown (in the present state of Virginia) in 1607 and Plymouth (in the present state of Massachusetts) in 1620. English colonists wanted to take advantage of the continent's natural resources and gradually pushed the borders of Spanish power southward into present-day southern Georgia. At the same time, French explorers were moving down the Mississippi River valley and eastward along the Gulf Coast. Britain gained control of Florida in 1763 in exchange for Havana, Cuba, which the British had captured from Spain during the Seven Years' War (1756-63). Spain evacuated Florida after the exchange, leaving the province virtually empty. At that time, St. Augustine was still a garrison community with fewer than five hundred houses, and Pensacola also was a small military town. The British had ambitious plans for Florida. First, it was split into two parts: East Florida, with its capital at St. Augustine; and West Florida, with its seat at Pensacola. British surveyors mapped much of the landscape and coastline and tried to develop relations with a group of Indian people who were moving into the area from the North. The British called these people of Creek Indian descent Seminolies, or Seminoles,. Britain attempted to attract white settlers by offering land on which to settle and help for those who produced products for export. Given enough time, this plan might have converted Florida into a flourishing colony, but British rule lasted only twenty years. The two Floridas remained loyal to Great Britain throughout the War for American Independence (1776-83). However, Spain - participating indirectly in the war as an ally of France - captured Pensacola from the British in 1781. In 1784 it regained control of the rest of Florida as part of the peace treaty that ended the American Revolution. When the British evacuated Florida, Spanish colonists as well as settlers from the newly formed United States came pouring in. Many of the new residents were lured by favorable Spanish terms for acquiring property, called land grants. Others who came were escaped slaves, trying to reach a place where their US masters had no authority and effectively could not reach them. Instead of becoming more Spanish, the two Floridas increasingly became more "American." Finally, after several official and unofficial US military expeditions into the territory, Spain formally ceded Florida to the United States in 1821, according to terms of the Adams-Onís Treaty. Andrew Jackson returned to Florida in 1821 to establish a new territorial government on behalf of the United States. 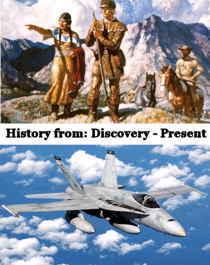 What the US inherited was a wilderness sparsely dotted with settlements of native Indian people, African Americans, and Spaniards. As Florida's population increased through immigration, so did pressure on the federal government to remove the Indian people from their lands. The Indian population was made up of several groups - primarily, the Creek and the Miccosukee people; and many African American refugees lived with the Indians. Indian removal was popular with white settlers because the native people occupied lands that white people wanted and because their communities often provided a sanctuary for runaway slaves from northern states. Among Florida's native population, the name of Osceola has remained familiar after more than a century and a half. Osceola was a Seminole war leader who refused to leave his homeland in Florida. Seminoles, already noted for their fighting abilities, won the respect of US soldiers for their bravery, fortitude, and ability to adapt to changing circumstances during the Second Seminole War (1835-42). This war, the most significant of the three conflicts between Indian people and US troops in Florida, began over the question of whether Seminoles should be moved westward across the Mississippi River into what is now Oklahoma. Under President Andrew Jackson, the US government spent $20 million and the lives of many US soldiers, Indian people, and US citizens to force the removal of the Seminoles. In the end, the outcome was not as the federal government had planned. Some Indians migrated "voluntarily." Some were captured and sent west under military guard; and others escaped into the Everglades, where they made a life for themselves away from contact with whites. 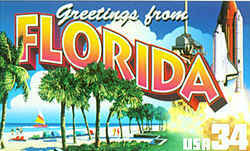 Florida became the twenty-seventh state in the United States on March 3, 1845. 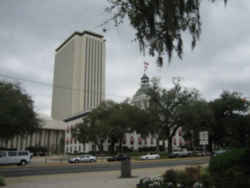 William D. Moseley was elected the new state's first governor, and David Levy Yulee, one of Florida's leading proponents for statehood, became a US Senator. By 1850 the population had grown to 87,445, including about 39,000 African American slaves and 1,000 free blacks. The slavery issue began to dominate the affairs of the new state. Most Florida voters - who were white males, ages twenty-one years or older - did not oppose slavery. However, they were concerned about the growing feeling against it in the North, and during the 1850s they viewed the new anti-slavery Republican party with suspicion. In the 1860 presidential election, no Floridians voted for Abraham Lincoln, although this Illinois Republican won at the national level. Shortly after his election, a special convention drew up an ordinance that allowed Florida to secede from the Union on January 10, 1861. Within several weeks, Florida joined other southern states to form the Confederate States of America. Florida provided an estimated 15,000 troops and significant amounts of supplies - including salt, beef, pork, and cotton - to the Confederacy, but more than 2,000 Floridians, both African American and white, joined the Union army. Confederate and foreign merchant ships slipped through the Union navy blockade along the coast, bringing in needed supplies from overseas ports. Tallahassee was the only southern capital east of the Mississippi River to avoid capture during the war, spared by southern victories at Olustee (1864) and Natural Bridge (1865). Ultimately, the South was defeated, and federal troops occupied Tallahassee on May 10, 1865. At the time of the 1876 presidential election, federal troops still occupied Florida. The state's Republican government and recently enfranchised African American voters helped to put Rutherford B. Hayes in the White House. However, Democrats gained control of enough state offices to end the years of Republican rule and prompt the removal of federal troops the following year. A series of political battles in the state left African Americans with little voice in their government. These development projects had far-reaching effects on the agricultural, manufacturing, and extractive industries of late-nineteenth-century Florida. The citrus industry especially benefited, since it was now possible to pick oranges in south Florida; put them on a train heading north; and eat them in Baltimore, Philadelphia, or New York in less than a week. In 1898 national attention focused on Florida, as the Spanish-American War began. The port city of Tampa served as the primary staging area for US troops bound for the war in Cuba. Many Floridians supported the Cuban peoples' desire to be free of Spanish colonial rule. State government began to represent a larger proportion of its citizens. Female citizens won the right to vote in 1920, when the Nineteenth Amendment to the US Constitution became law. In 1937, the requirement that voters pay a "poll tax" was repealed, allowing poor African American and white Floridians to have a greater voice in government. In 1944 the US Supreme Court outlawed a system of all-white primary elections that had limited the right of African Americans to vote. One of the most significant trends of the postwar era has been steady population growth, resulting from large migrations to the state from within the US and from countries throughout the western hemisphere, notably Cuba and Haiti. Florida is now the fourth most populous state in the nation.